I'm frequently asked after the first couple of warm days (usually in February), "When should I fertilize my lawn?" Maybe it's the advertisers' premature promoting lawn food to green up the grass. Or, maybe it's just the gardening bug in general. Or, perhaps are wanting to get a jump on weed control by laying down a weed preventer/fertilizer combo product. Whatever the reason, February is way too early to fertilize your grass. So, just when should you fertilize your grass. 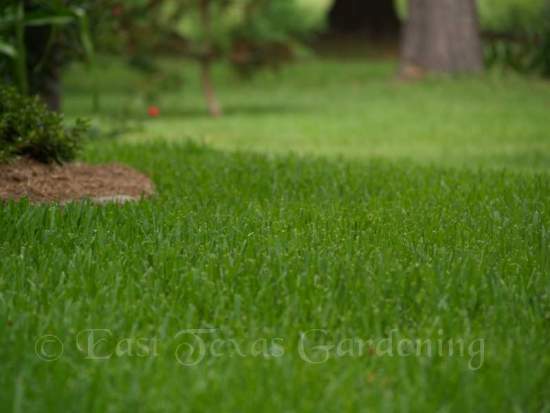 Here in Northeast Texas, the permament grasses for lawns are categorized as warm season grasses. They include Burmuda, St. Augustine, Centipede and Zoysia. These basically respond to emerge from winter dormancy by the air and soil temperature. Fertilizing too early may force faster leaf growth when the weather warms a bit, but that's at the expense of the turf reestablishing a good root system to support leaf growth. Grasses use stored up food reserves in their stems (stolons and rhizomes) to initiate spring growth. That food reserve is also needed to strengthen and support the root system which in turn can supply the new growth. Forcing the grass with early nitrogen can lead to some imbalances in growth which can stress the grass as it transitions out of winter dormancy. Bottom Line: Turfgrass researchers recommend fertilizing southern lawn grasses after the grass has initiated new growth on its own. My recommendation is to wait to fertilize your lawn, regardless of type of grass, until after you have mowed it once or twice - that is, actively growing turfgrass, not mowing winter weeds. This usually means your first fertilizer application for Bermuda and St. Augustine is sometime in early to mid-April, and Centipede and Zoysia as late as early to mid-May. So, what about those combo weed and feed products? While it is too early to fertilize, mid February to early March is about the right timing for laying down a pre-emergent herbicice (weed preventor) IF YOUR LAWN NEEDS IT. All caps because these products tend to stress the grass even more than it is already under stress (coming through the dormant cold season and working to establish new roots and shoots). How do you know if you need a weed preventor? First, if you have weeds actively growing now in your lawn, realize those are cool season weeds that will not respond to a weed preventor (preemergent) product. Preemergent products work by killing the germinating seedling. Once up and growing, weeds are past the stage of being being controlled by preemergent herbicides. Warm season weeds are the what is currently germinating in response to warmer soil temperature - things like crabgrass and grassburs.